Hydrazine is a colorless flammable inorganic liquid compound with ammonia like odor. Hydrazine is highly toxic in nature. The compound is highly unstable as well unless handled in solution form. The common use of hydrazine is as a precursor to blowing agents. The gas-forming agent in air bags is sodium azide which is produced from hydrazine by reaction with sodium nitrite. They are used as fuels in rocket and spacecraft powered engines. Hydrazine is a strong reducing agent. Thus it is used for corrosion control in hot water heating systems and boilers, for metal plating, and for reducing noble metal catalysts and unsaturated bonds in organic compounds. It is also an oxidizing agent. Hydrazine is the initial compound for several derivatives; amid which, foaming agents for antioxidants, polymers, plastics, polymer cross-linking and chain extending agents, as well as biologically active pesticides, herbicides, plant growth regulators and pharmaceuticals are significant. Thus, hydrazine is utilized for many industrial applications including preparation of polymer foams, polymerization catalysts, agrochemicals and the gas used in air bags. Several vital pharmaceuticals are built on hydrazine and its derivatives. Hydrazine is also utilized in various rocket fuels, in nuclear and conventional power plants, in organic synthesis and in fuel cells as a safer alternative to hydrogen. Hydrazine Market is anticipated to record a significant CAGR over the forecast period. Many multi-national companies are concentrating towards new product advances in hydrazine. Moreover, the many advantageous properties of hydrazine are exploited in the field of photographic chemicals and dyes now and then. New uses for hydrazine derivatives are discovered daily which is expected to drive the hydrazine market rapidly. At present the global hydrazine market is observing vibrant growth owing to increasing demand of polymer foams in the market. Advances in aerospace industry in the past few years and growing space explorations are projected to drive hydrazine market. It also has a wide range of functions in development of products such as foamed core pipes, wood grain furniture, food containers, vinyl sheets and structural foam etc. As a precursor to blowing agent in polymer industry, North America is panned to observe substantial hydrazine market growth due to rising hydrazine usage. North America follows Europe in terms of consumption due to expanding hydrazine requirements in agro chemical and water treatment industries. Asia Pacific is expected to drive a demand and positively impact hydrazine market growth over the forecast period owing to increasing hydrazine application for refining and purification process. Due to multiplying hydrazine uses in growing end-use industries such as agricultural, polymer, pharmaceutical, agrochemicals, industrial and water treatment, Asia Pacific is budding as a regional hydrazine and its derivatives consumption market. The rising demand for hydrazine and its by-products for various processes in pharmaceutical, agrochemical, aerospace industries are expected to drive the market rapid over the forecast period. 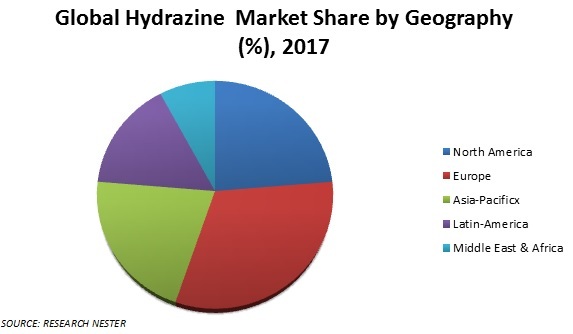 The growing R&D activity associated with hydrazine is further expected to increase the market growth owing to frequent discovery of new applications. Application of hydrazine in the recovery of valuable metals escorts towards early recovery and high purity of metals. The numerous uses of hydrazine in recovery, refining and purification processes of gold, platinum and silver as well as reducing agent in boilers will further increase its market demand in the near future. Rapid economic development with thriving manufacturing sector is expected to boost the hydrazine market in the Asia Pacific region. However, health hazards associated to the use of hydrazine which includes irritation of eyes, nose and throat leading to conditions of nausea and headaches on exposure to hydrazine can act as a potential hindrance to the global hydrazine market. In acute conditions, severe exposure to hydrazine may direct to harm the kidney, liver and the central nervous system. Nippon Carbide Industries Co. Inc.